Roy has a look at some trade options we might have missed in round one as well as releasing his Rolling 22. It’s only round one but captain hindsight is going to force our hand with some patch up trades. Now although I am not a fan of trading premiums, there is some leeway in the first couple of weeks if you think you can get the same output from players priced significantly less. 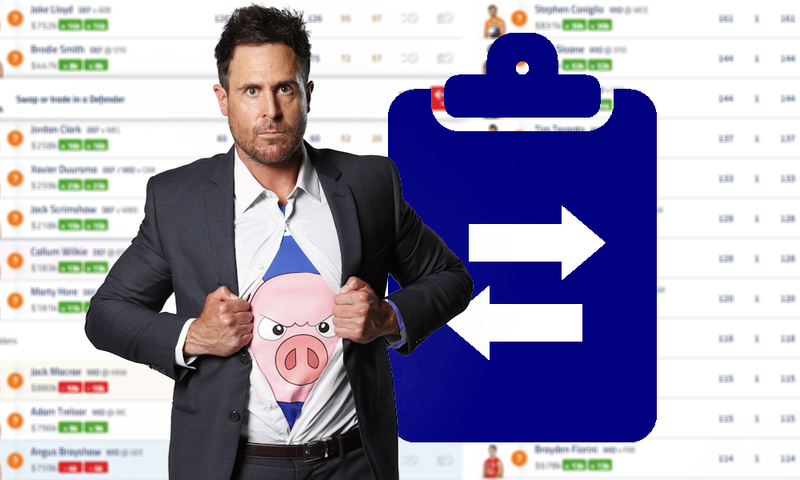 Only 15% of the competition backed in the fact our Pig had a full pre season, believed Ken Hinkley that the Powers horrific game play had changed and the fact they were allegedly allowing Rocky to return to the mud (as an inside mid). That leaves 85% of us requiring a trade, but be smart about it, I have been asked whether to trade Brad Crouch or Tim Taranto to him… The answer is no, they are huge value themselves. Players like Zach Merrett however, is a no brainer. Another Power player embracing a change of game plan and a return to their best playing position is Boaky. It is probably the best I have ever seen him play, absolutely dominating as a midfielder with 34 possessions, nine marks and eight tackles for 144. His most possessions last year was 29 and his highest score was 113. All this and he can be selected as a forward. A third year breakout was always on the cards for the young Giant star and he rewarded coaches who took the punt in monumental fashion. Traditionally a good tackler, he started the year in fine form with 40 points worth of them to go with his 30 touches and two goals got him to 137. He is a gun and massively under priced. Had to wait until Sunday night to see the young star do his work out on the wing for the Roos but it was certainly worth the wait. He was so calm with ball in hand and his 21 disposals reflected that as he also added a handy eight marks by utilising his ability to get into open space. He has quickly become the must have rookie on the back of his 97. Believe the hype, the Worp is in the guts and ready to dominate… All while being listed as a forward. He had 27 possession and kicked two goals against the Crows star studded midfield for 101. He is currently owned by 23% of the competition and has a break even of just 51 and is a great price for a forward capable of pumping out scores like that, with a role like that. Maybe Tom Browne was right and Merrett did his knee in that pre season incident that caused him to miss a couple of weeks. Whatever it was, he is under done and a far cray from the guy we flagged as potentially returning to his 118 ways at the start of the year. Add to that, the Bombers looked poor and it will be a tough gig maintaining a good average unless they drastically change things. There is your easy way to get Rocky. At this stage I am prioritising getting the Pig. It looks like the unlucky victim will be Brayshaw in a cash grab given they will likely average around the same. My other trade will be patching up one of my rookies that will inevitably get dropped on the bench. Reminded us not to overthink quiet games in the JLT after many coaches put a line though him in week 2. Forced his way to number one with yet another thumping score without Dylan Shiel. Is everyone else’s page refreshing to scratch after you post a comment? Really frustrating to have to scroll down, click on comments button, then scroll down to bottom of comments every time. I’m going to assume it’s from RDT. Probably not easy to compare but you definitely have a stronger midfield than mine (AFL Fantasy). But my other lines must have made up the points to score just a little higher. Bad luck with bailey scott mistake, but at least you don’t have to trade him in. Awesome start! Is there still a way to reverse one trade? E.g. I’ve traded Dusty to Macrae but I haven’t decided on my second trade. If I test out a second trade, will I be able to reverse it after the Richmond v Collingwood game?